Imagine meeting your favorite musician. Now imagine being invited backstage and ultimately to join the band as a roadie. This happened to me with blues legend, Albert Collins. This story includes some big life lessons learned from the experience, plus a run-in with The Black Crowes and The Kids in the Hall. Always treat your fans with love and respect. I was twenty years old, my friends and I were parking the car across the street from the venue where this story begins. As we were pulling in a tour bus had pulled up along the side of The Concert Hall. My favorite blues artist, Albert Collins and his Icebreakers had arrived. My friends pushed me to run across the street to say hello. We weren’t star struck types, but it seemed like a great idea. I stood at the base of the steps of the bus, trying to peer in through the tinted glass door. Suddenly it opened and Albert Collins appeared smiling to me. I said welcome to Toronto, and he thanked me and handed me his guitar in its case. Albert fans know him as The Master of the Telecaster… he handed me “the telecaster”. The side door of the venue opened and I was guided in by security. It was surreal. Albert and I got to chat for a little while as the band set up. I explained my deep love of blues and how much I enjoyed his music. He introduced me to the band and his road manager. I hung out as the band did their soundcheck. Meanwhile, across the street my friends wondered if I had been hit by a car. When it was show time they gave up on me and went into the venue. A missing friend was no reason to miss seeing a blues legend perform. Just before it was show time, Albert asked if I wanted to come backstage after to hang out and chat more. He even invited me to bring my friends along. I was on cloud nine! He was the nicest guy I had ever met. Give your fans more than they expect. The band began playing and I caught up with my friends. I was still in shock with how unbelievable the evening had already unfolded. They were equally excited when they learned they were invited to meet Albert and his band after the show. We joined Albert and the band after their outstanding performance. We all got to hang out and enjoy the conversations backstage. At the end of the night Albert asked if I wanted to join them on the tour bus to their next gig in Kitchener to a club called Pop the Gator. He said he could teach me how to carry his patch cable, so I could assist him as he performed his classic guitar solos walking through the audience. I was flabbergasted and said of course I would love to join them. As we departed the road manager pulled me aside to let me down easily. He said Albert loved inviting his fans, but it was unrealistic. I understood. The night was one of the best experiences of my life. No worries that I wouldn’t be able to join them. Get your own hands dirty too. The next morning the road manager called me bright and early. Albert had insisted I be invited to join the band. I jumped in a taxi and hurried to the hotel. Albert was waiting for the band in the bus, his bus. He drove and maintained his own tour bus! We sat inside waiting for his band and he recollected stories of when he jammed with Jimi Hendrix. Here I was sitting in a tour bus, about to be a 24-hour roadie for a living legend. That night Albert taught me how to handle his patch cable as he played his solo. My job was to be sure he didn’t trip on it — scary stuff. If you are not familiar, Albert would play his solos through the audience, but he also sometimes exited the club and went out onto the street. Sometimes the audience would even follow him outside. He once entered a convenience store and bought a candy bar — as he was doing his guitar solo. Amazing. The adoring audience screamed with joy as he jumped off the stage and began working the room during his solo. I scrambled behind him catching and regrouping the cable. Smiling fans kept patting me on the back and shoulders. It was exhilarating. Albert and I kept in touch between his visits to Toronto. When he returned the following year, he invited me to join the band and help with the cable again. The gig was upstairs at the El Mocambo in Toronto, I was not expecting to meet several famous people there. When my friend and I entered the club we immediately zeroed in on members of The Kids in the Hall (KITH) sitting at a large table with Chris Robinson from The Black Crowes. I didn’t care much for The Black Crowes music, but seeing the KITH in person was exciting. I was a diehard fan. Long-haired Dave with Albert Collins and friends. I decided to go over to say hello and to tell the KITH how much I loved their show. I wasn’t going over to annoy or bother them. As I walked towards the table, Chris Robinson turned and looked at me. He immediately waved over a security guard, who intercepted my approach and shooed me off. He told me not to try to visit the table again. During this encounter, Chris Robinson smirked at me. What a jerk. Albert had an amazing set. The crowd were thrilled as he played his guitar solo walking between tables and eventually out on to the street below the club. As we planned, I carried Albert’s cable once again. After the show, Albert and I sat behind a small table in a hallway. He always signed autographs and met his fans after his shows. I told him about what had happened earlier with Mr. Black Crowes, and he shook his head in disappointment. He explained how you have to fight letting fame get to your head. The line of fans waiting anxiously to meet the Master of the Telecaster began to disperse. Then at the end of the hall, Chris Robinson appeared. As he approached the table he recognized me sitting next to Albert. Suddenly, Albert called over security and instructed the man not to allow Chris Robinson to come any further. The look on his face was priceless. Reflect on what got you where you are. As I helped Albert and the Icebreakers load his bus, he turned to me and surprised me with an offer. Albert asked if I wanted to join the band as a permanent roadie! Without hesitation, I said yes. On his next trip back to Toronto, he would pick me up and I would begin officially working. It was nuts. I was prepared to drop out of college to become a roadie for one of the most famous blues guitarists of our time. A month or so later as I continued to study radio broadcasting, I received sad news. Albert had passed away. The host of a nationally, syndicated blues radio program happened to be a professor at my college. John Small invited me to join him in the studio to share my story on Blues North, which friends heard across Canada (and into the States). After doing the show, John hired me as an intern to co-write and co-produce the program with him and his producer, Shawn. I got my first taste of working in radio because of Albert Collins. I didn’t pursue my career in radio, but I did end up working in different media companies like a newspaper and a television network. In fact, I probably wouldn’t have started podcasting without knowing what I know from my radio education. It’s good to stop and reflect on where you came from. 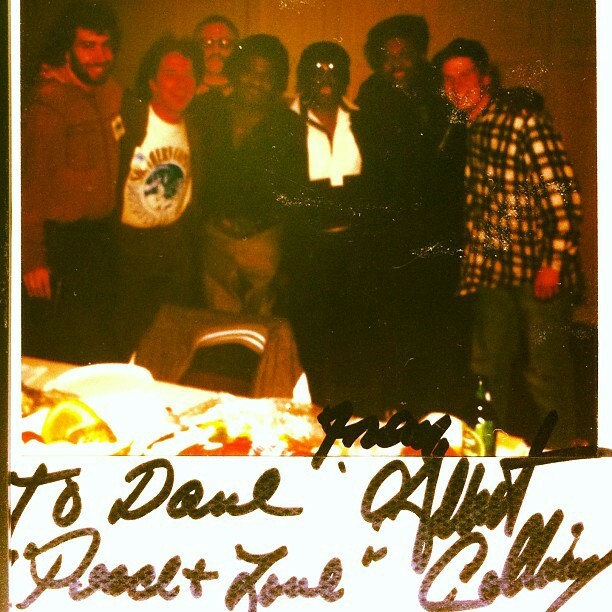 So there you have my Albert Collins story and the lessons I learned from the experience. Albert taught me to be humble, kind and outgoing. He was an amazing talent and person. Be sure to check out this clip of Albert in action. Have you had any crazy experiences in your life that led to shaping who you are? Tell me about them.